And so we continue with the issue of terroir. I was enjoying a glass of Cabernet Franc when my imaginary friend stopped by. Polite as I raised to be, I asked if he would like to have one too. He declined, saying Cabernet Franc was not his wine of choice. Too soft, too light, too thin he said. He preferred a wine of more structure and with more grip, like Cabernet Sauvignon. I found that interesting, because it was Cabernet Franc (along with Sauvignon Blanc) that gave birth to Cabernet Sauvignon, but never mind. I didn’t mention it. I poured him a glass of wine away from the table and asked him to taste it. I didn’t disclose it was Cabernet Franc. 100% unblended, pure Cabernet Franc. Dark and foreboding in the glass. Serious stuff. I’m not being facetious. This wine is dense, silky, rich and deep. But I had promises to keep. I needed to finish this exercise in terroir. If ever, there was a good opportunity to do so, this Cabernet Franc from Raats Family Vineyards would allow me to do so. Raats Family Vineyards are in the Stellenbosch District, south-western South Africa, about 25 miles east of Cape Town. The Atlantic Ocean is west, Walker Bay south. Although soil types vary within the district, and the district is divided into sub-regions (called wards), the overall climate is Mediterranean. Summers can be hot with abundant sunshine. Generalizations, however, are dangerous. Many producers vinify fruit from vineyards throughout the area. Further north, summers are just slightly warmer than Bordeaux. Prominent mountain ranges run throughout Stellenbosch, offering` a range of altitudes, aspects and soil. The mountains also help channel wind through the vineyards providing respite from the morning’s hot sun. That Stellenbosch produces Cabernet Sauvignon and Shiraz (Syrah) is an indication of the District’s overall warm conditions. 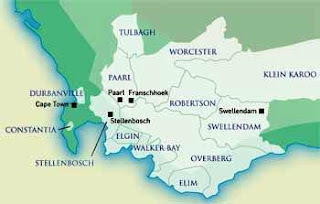 That it also produces Chenin Blanc (called “Steen” locally) is an indication of the area’s diverse growing conditions. But whether you compare the Chenin Blanc or the Cabernet Franc of South Africa to that of France’s Loire Valley, you’re certain to taste the difference. Which style you prefer is not important (to me). What is important is that you know of it and what contributes to each style’s uniqueness. As with all wineries that come to mind, Raats offers several labels within the same varietal. Pictured here is their entry label (a 2011) retailing at $33.99. One sip and you know something different is going on in your glass. Viscous, dark fruit overlaid with a layer of dark chocolate. First impression: black cherry, lots of cassis, some dried herb. This is somewhat like, more than a passing relationship to – Cabernet Sauvignon. Now you understand how Cabernet Franc was the parentage of Cabernet Sauvignon and where the latter inherited some of its characteristic from the former. All of Raats’ Cabernet Franc is grown within Stellenbosch, all of it upon the decomposed dolomite granite soil of mountain foothills. Wine produced from these vines offer good acidity and minerality. The wine has body like a Cabernet Sauvignon and some grip, yet interestingly smooth tannins – a nice balancing act. Black cherry and plum, a note of tobacco. If this is Cabernet Franc (it is), it is unlike any other you have had (assuming you don’t regularly enjoy it already). Whether this varietal grown under these conditions is better than, for example, the Cabernet Franc of California or Washington State or New York or France’s Loire Valley isn’t even the question. Tasting the differences is the answer. The question is which style do you prefer? However you answer, you’re right. ** You’re missing out if you haven’t yet liked Wine Mizer on facebook where I post almost every day. Mini-reviews of wine. Wine & food pairing suggestions, jokes, puzzles and more. Vineyard blocks are hand-picked. Hand sorted three times in the cellar, crushed and cold-soaked on the skins for 5 days, basket pressed and allowed malolactic fermentation in steel. Aged 18 months in (25% new, 25 second, 25 third and 25% fourth) French Vicard and Mercury oak barrels. Not fined and not filtered.